Developer: Rare, Williams Electronics, Inc.
NARC is a 1988 arcade game designed by Eugene Jarvis for Williams Electronics programmed by George Petro. It was one of the first ultra-violent video games and a frequent target of parental criticism of the arcade game industry. The object is to arrest and kill drug offenders, confiscate their money and drugs, and defeat "Mr. Big". It was ported, not long after, to the NES and several home computer systems in 1990. In 2005, it was also updated into a brand new game for the Xbox and PS2. Released in 1988, it was the first game in the newly restarted Williams Electronics coin op division, and features their notable use of digitized graphics (later made famous in games such as Mortal Kombat). In fact, the quality of the graphics in terms of number of colors would not be surpassed until the game Mortal Kombat II (released in 1993). The game features what in arcade terminology is termed a medium resolution monitor - higher resolution than televisions and normal arcade monitors, although often in a smaller physical size. 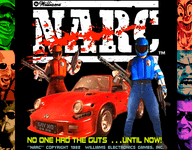 NARC was also the very first arcade game to utilize the TI TMS34010, which is a 32-bit processor. The game was also notable for the numerous voice samples used during and between levels.